Limited Art Edition of Christo’s personal, signed project book The Floating Piers with lithograph, The Floating Piers, Lake Iseo, Italy, 2017, a stunning, grand scale aerial photograph by Wolfgang Volz, signed by Christo, and including a piece of the original project fabric. 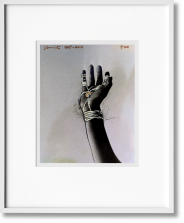 Limited Art Edition of 100 copies (No. 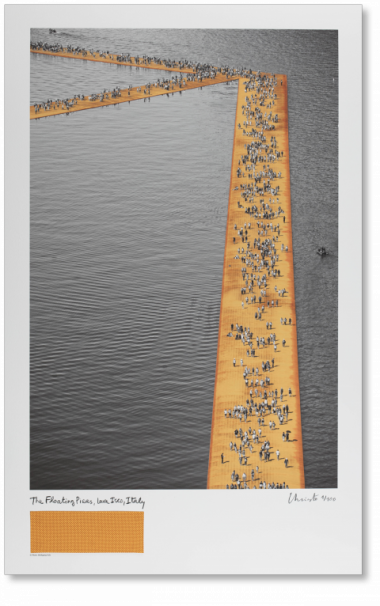 61–160), with signed and numbered lithograph The Floating Piers, Lake Iseo, Italy, 2017. 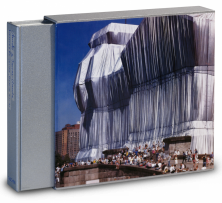 This artwork comes with the limited-edition project book about The Floating Piers, signed by the artist and Wolfgang Volz. 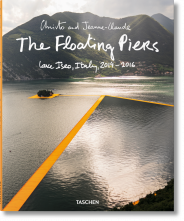 From June 18 to July 3, 2016, 100 kilometers east of Milan and 200 kilometers west of Venice, The Floating Piers by Christo and Jeanne-Claude allowed 1.2 million people to walk on water. 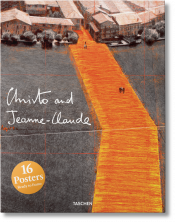 The project, comprising 100,000 square meters of shimmering saffron fabric above a modular floating dock system of 220,000 high-density polyethylene cubes created a three-kilometer walkway across the surface of Lake Iseo, connecting the mainland to the islands of Monte Isola and San Paolo. 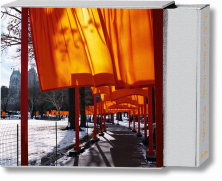 “It is all about walking,” said Christo of the project. “Including the stretches on the land, you have to walk five kilometers to appreciate the project, the constantly changing views, the lake, the mountains, the other visitors. All these things together are the final artwork.” The experience was as tactile as it was visual, a multisensory wonder of undulating fabric, shimmering yellow, and ever-shifting light upon the water. 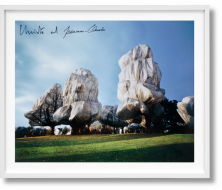 In this personal project book, signed and designed by Christo himself, the artist presents this extraordinary environmental work from start to finish. On 846 pages, he reveals the couple’s earliest concept of a floating surface on water back in 1970 through renewed interest in the project, research into possible locations, technical developments, material production, and the final 16-day experience with enraptured visitors from around the world. This limited Art Edition combines the project book with a 24 x 24 cm swatch of the project’s original dahlia yellow fabric as well as the lithograph The Floating Piers, Lake Iseo, Italy, 2017. This stunning, grand scale aerial photograph by Wolfgang Volz is signed by Christo and includes an original sample of the project fabric.